It’s essential to do proper flight testing before and after installing any VGs. Record the results, don’t depend on memory! Not only will you be able to measure the differences, but you’ll learn a whole lot about the handling of your aircraft. Do the first flight tests without VGs early one morning, install the VGs during the day, and flight test again with VGs early next morning when conditions will be consistent. Instructions for the flight testing procedure are at Fight Testing. It's also essential to establish that the CofG of your aircraft is correct before installing VGs. And here we're talking about the actual loaded CofG as it is for flight right now, not just the empty aircraft, or calculations way back when it was built. I know that very few aircraft owners ever do a weight and balance other than when it was built, but it sure is worthwhile exercise - now is a good time to do it! Instructions for Installing Stolspeed VGs on your aircraft. First it’ll be necessary to apply the special adhesive to the VGs. This adhesive comes as a thin sheet in a sandwich between two backings. It’s a solvent-free, acrylic adhesive that won’t damage any paint surface. Once firmly pressed onto a clean surface it bonds really well, but still has flexibility. Sudden impacts will not knock it loose, but it can be peeled away by pulling steadily on the VG and sliding a razor blade under. To remove any remaining adhesive from the surface, just rub with your thumb and ‘roll’ it away in a little rubbery ball. It’s a perfect adhesive for this purpose! The sheets of adhesive now come already laser cut to the footprint of each VG. The laser often cuts through the backing of the adhesive as well, so to keep all the parts stable, place a couple of runs of masking tape across the backing (the printed side), as shown below. With the tip of a trimming knife, lift the front tip of the covering layer from a footprint. Wipe the bases of all the VGs with methylated spirits, also called denatured alcohol or methyl hydrate. Place a VG onto each footprint of the adhesive. Holding each VG, rub the backing with a fingernail to press the adhesive firmly onto the VG and expel any air bubbles. Hold each VG by the vertical wing and bend the adhesive backing away, starting at the tip of the VG. This should lift the VG, with the adhesive stuck to it, from the backing. The ideal temperature for applying this adhesive to the wing surface is between 60°F(15°C) and 100°F(38°C). If the temperature is below 50°F(10°C) the adhesive may not 'flow' properly for a good bond. If it's too cool use a heat gun or hair dryer to carefully warm both the wing surface and the VG. If your aircraft will be parked in the sun for much of the time, it's a good idea to paint the VGs. We have added the maximum UV protectant that is possible, but the thin section and transparency of these VGs will still allow some UV damage. It's also worth painting the VGs for appearance, in that the transparent base will allow any dirt that migrates under the edges of the base to show through. If you wish to paint your VGs, it is best done before they are installed on the wing. Even on a new aircraft it’s much better to first paint the wing without the VGs on, paint the VGs separately, then stick them on. It's a bit tedious, but wipe the VGs with alcohol to clean off any release lubricant from the injection molding process. It's very easy to paint the VGs on the adhesive sheet. Stick them in their spots on the adhesive sheet. Then attach the sheet to a block of wood to keep it from blowing away with spray blast. Spray them with several light mist coats, with a pause between each coat to allow the thinner to evaporate. Don't blast them with too much paint, just enough to give an even color. Keep in mind that the VGs are flexible, so you won’t want a thick layer of brittle two-pack paint. Keep the paint layer thin, and without hardener if possible. There may be kits out there, sent out before the pre-cut adhesive was available. 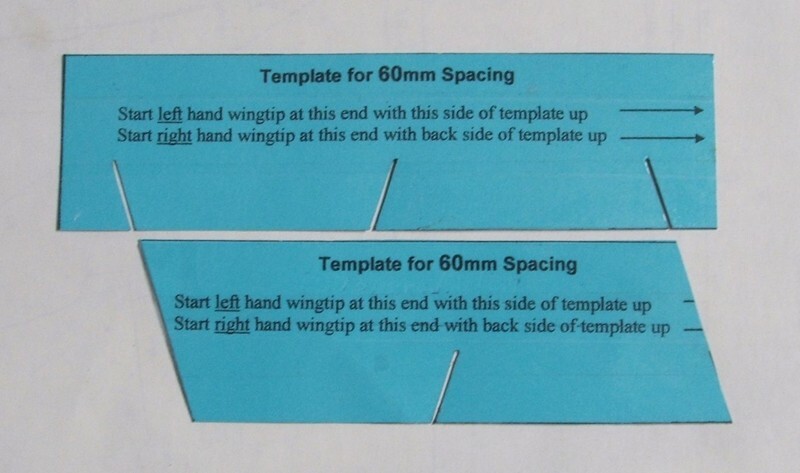 In that case you can cut out the adhesive manually as below, or email stolspeed@gmail.com with your mailing address, and pre-cut adhesive will be supplied at no cost. With a sharp trimming knife, slice the adhesive sheets lengthwise into 25mm (1in.) wide strips. Peel back the shiny-side backing of the strip as you place the VGs side-by-side across the strip, and press them firmly onto the adhesive. With the sharp trimming knife, cut around each VG, right through the backing under the adhesive. Those little, curved fingernail scissors are also ideal for this. Rub the backing firmly with a fingernail to press the adhesive onto the VG and expel any air bubbles. The VGs need to be positioned such that they have the best ‘bite’ at the airflow when the wing is at the stall angle of attack. If they are too far aft they risk being buried in the thickening boundary layer and the start of separation, so they lose effectiveness at stall. Some have suggested that too far forward may slightly increase drag at cruise, but I have never been able to measure any loss of cruise speed. Better to be farther forward than too far aft. So, with the wing positioned at the stall angle of attack, the VGs should be slightly forward of the highest point of the airfoil. From 8-10% I could detect no difference at all in stall performance, but would recommend not placing the VGs farther back than 12%, in case they become buried in the thickening boundary layer and suddenly loose effect at a high angle of attack, just when they are most needed. I have tested them at much farther forward positions and found the effectiveness unchanged. I couldn’t measure any change in drag at cruise speed with the VGs at any position. Those figures are to the highest point of the VG, but since it's easiest to measure to the front tips of the VGs, I recommend starting with the tips at 7% of chord aft of the leading edge - this puts the highest point of the VGs at 8.8% on a 1200mm (47") chord or 8.5% on a 1500mm (59") chord, which is a typical range of chord lengths for light sport aircraft. We use the measurement to the tips of the VGs to mark the line on the wing because it's easier to place the VGs accurately to this line. If you try other positions and get significant results with your aircraft, please let us know so that others can benefit. There are specific measurements for the Zenith 701, 801, and 601 aircraft on their respective pages in the main menu. Wash the wing thoroughly with detergent (not one of those automotive ‘wash-and wax’ products). Measure the chord of the wing from the front of the leading edge to the aft edge of the ailerons or flaps. In the case of detached flaperons, measure to the aft edge of the main wing. If the wing is tapered then measure both at the root and the tip. Measure from a vertical line extended above the leading edge, with the aircraft at flying attitude. A carpenter's level is convenient to establish this vertical. Calculate 7% of each the those measurements. Measuring from the leading edge again, mark those 7% points on masking tape at the ends of each wing. Wipe a zone along that line with alcolhol. Stretch a string line tightly over those marks, and secure it with masking tape at a couple of intermediate points. Remove the backing from the adhesive on a VG. Set the first VG in a notch of the 60mm template. Carefully touch the very tip of the VG to the wing surface right behind the line. Guided by the angle of the template, lightly set the base of the VG onto the wing surface. Double check the alignment, and if correct, press the VG firmly onto the surface. Rub each side of the base firmly with thumbnail or a popsicle stick to press out any air bubbles. With the template secured by the first VG, use the remaining notches to set two more VGs in place. Move the template so that the third notch is secured by the last VG already set, and set two more. Continue to place 15 VGs at the 60mm spacing = 900mm (3ft) from the wingtip. Do the remaining portion of the wing with the 90mm spacing template. 120 VGs is enough to do 9.9 metres (32 ft) of wing at this spacing. If a VG happens to land on a rivet or a seam, displace it just enough to miss the obstacle, then continue the regular spacing. Stretch a line on the underside of the horizontal stabilizer, 100mm (4”) in front of the gap between the stab and the elevator. Using the 30mm spacing template, set a row of VGs with the front tips along that line, starting from the outside. If the surface of the horizontal stabilizer is flat, the curved base of the VG will contact only at he tip and the heel. Rub the VG on a piece of sandpaper laid on a flat surface to adjust. Don't try to completely flatten the base - just make flat areas at the tip and heel, the adhesive will do the rest. Since the VGs need to be oriented with respect to the airflow rather than the leading edge, a slightly different procedure is needed with a swept-back leading edge. The VGs are effective at angles from 10º to 20º, so setting them at 15º allows for best margin of variable airflow. There will be very little spanwise flow this far forward, so we can orient the VGs to a reference line at right angles to the centre line of the aircraft. Snap a chalk line 7% back and parallel to the leading edge as before. Snap a couple of spanwise reference lines at right angles to the aircraft center line. Cut the templates completely across at the end slots. With the VG in the center slot, and the VG tip on the 7% line, orient the template so that it is parallel to the spanwise reference line rather than the leading edge, with one end of the template against the fin of the last VG already placed. Flip the template over, end for end each time, to match the angle of the previous VG. Please note that Stolspeed VGs are not approved for certified aircraft. Polycarbonate is very tough stuff, but fuel destroys it!